. I’ve originally found this brand at 99 Ranch (they do not carry it at common grocery stores such as Ralphs or Vons), but recently I also found it on amazon (in packs of two) which is very exciting (buy now)…saves me a trip to 99 Ranch! If you have another favorite brand of Hoisin Sauce let me know! If you make this dish alongside some Sweet Chili Lime Tofu or Garlic Pepper Tofu, and brown rice or quinoa, I promise you will not miss going out for Thai Food! Unfortunately the Hoisin Sauce I recommend in this recipe is not gluten-free. For a gluten-free option, I recommend Sun-Luck Hoisin Sauce. I’ve found it at my local Ralphs Grocery Store. It also tastes great and is very similar to the Koon Chun Hoisin Sauce I recommend above! This Thai Basil Eggplant is a vegan, gluten-free, healthy dish based on a popular restaurant-favorite! No frying necessary, easy 5 minute sauce, and full of flavor! Cut off the top and bottom tips. If you are using Italian eggplants: Slice the eggplant lengthwise into 3/4-inch slabs. Then cut each slice lengthwise into 3/4-inch slices. Cut each slice into 2 or 3 pieces diagonally (see picture above for an example of how the eggplant pieces should end up looking). If you are using Chinese or Japanese eggplants: Slice the eggplant in half lengthwise. Then diagonally cut small sections about 3/4-Inch thick all the way down both halves. In a large non-stick pan or stainless steel pan, heat 2 or 3 Tbsp of cooking oil on medium heat. Add the eggplant pieces and toss to coat them in oil. Add a little amount of water, turn the heat down to low-medium, cover, and let the eggplant cook. Stir the eggplant pieces every few minutes. 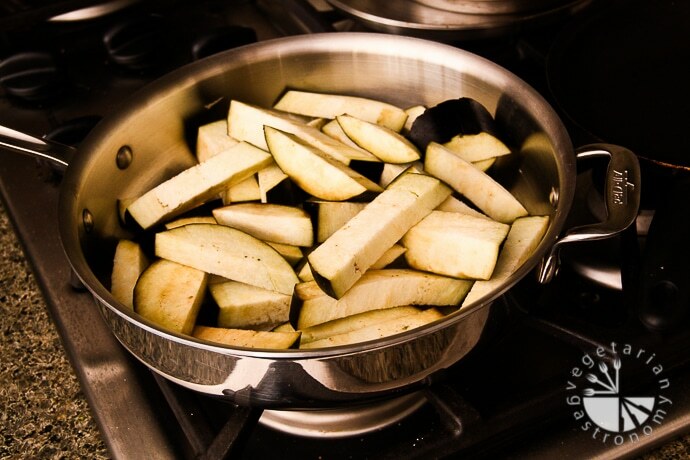 Add a little more oil or water to help cook the eggplant and keep it from sticking to the pan if needed (if adding water to help cook the eggplant, be sure to add a small amount each time so that you don't end up with watery mushy eggplant). While the eggplant is cooking continue on to preparing the rest of the dish. The eggplant is done once it is tender, but still firm so it holds shape. Turn off the heat and set aside in the pan. Cut the tofu block in half. Place each half in a clean paper towel one at a time and squeeze gently to remove excess storage liquid (without breaking up the tofu). 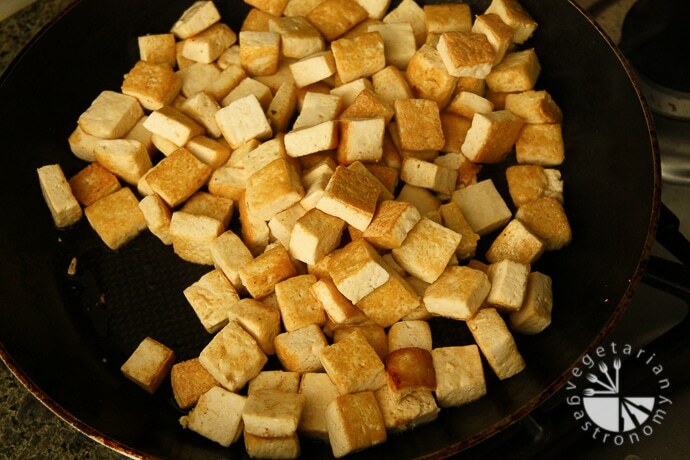 Cut the tofu into 1/2-Inch cubes and pan fry on medium-high heat with 2 Tbsp cooking oil (in another non-stick frying pan). Turn the tofu frequently until all the water is burned off and the tofu is lightly golden brown on most sides (be sure not to burn the tofu). Once the tofu is done, add it to the eggplant. In the same non-stick frying pan, add 1 tbsp cooking oil and heat on medium-high. 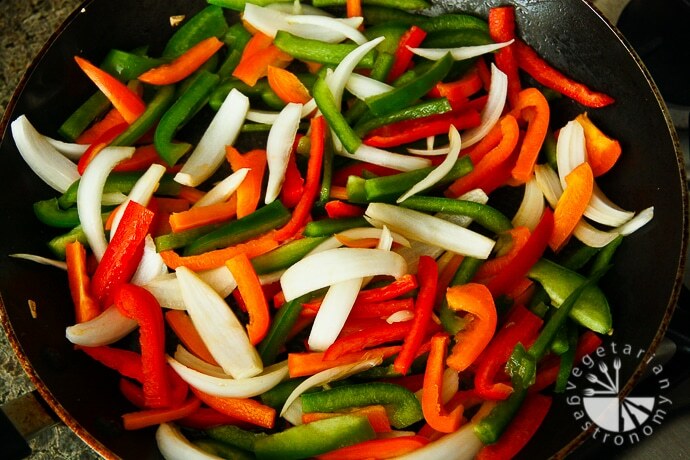 Add the thinly sliced onions and bell peppers. Saute until they are cooked but still crispy. Add the minced garlic half way through and saute it into the onions and bell peppers. 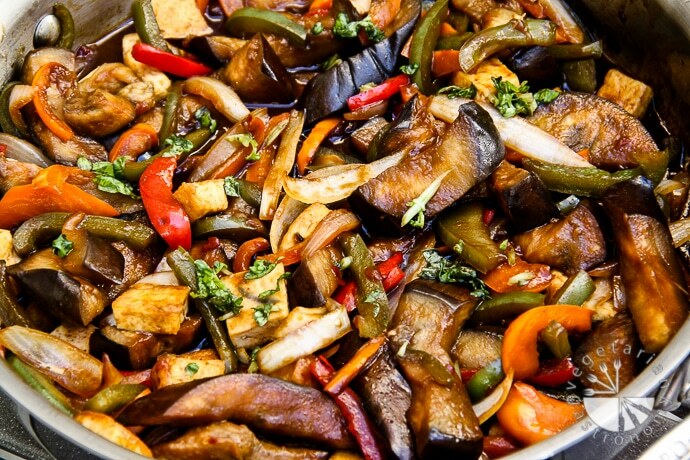 Once the veggies are done, add it to the eggplant and tofu. Whisk all ingredients listed under sauce above. Mix until all the cornstarch has dissolved. Add more chili sauce if you prefer additional spice. Heat the pan containing eggplant, tofu, and veggies once more. Once the pan is hot, add the sauce, turn down the heat to low-medium and mix frequently until the sauce slightly thickens and coats the eggplant and veggies. This should only take a few minutes. Turn off the heat and add some freshly chopped basil. Mix once more and serve hot with some cooked quinoa or brown rice! Koon Chun Hoisin Sauce does contain gluten, so for a gluten-free option, I recommend using Sun-Luck brand Hoisin Sauce. I've found that all store-bought hoisin sauces very considerably in taste. Depending on the brand you use, feel free to adjust the amount of tamari or soy sauce as needed. 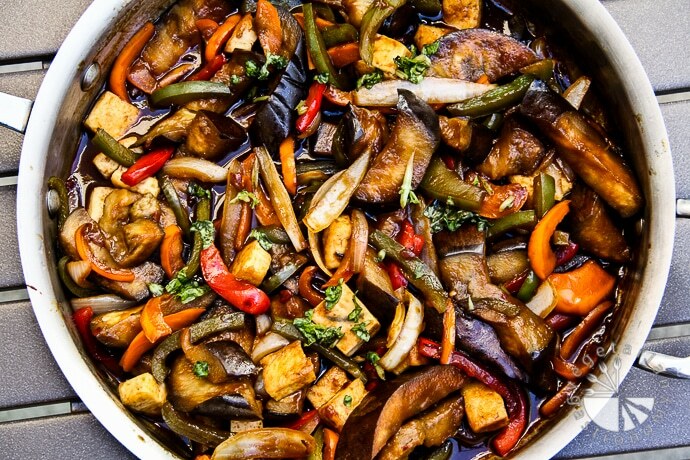 To make this dish faster, be sure to cook the tofu/veggies at the same time as the eggplant using 2 different non-stick pans. A few of you have asked for the ingredients of the Koon Chun Hoisin Sauce I recommend and use. I emailed them directly and here are the ingredients:Sugar Bean paste (water, soya bean, salt and wheat flour) Rice vinegar Salted Garlic Sesame Seed Oil Salted Chili Spice ( Fennel Seed and Sichuan Pepper) Food Color ( FD&C Red#40)Let me know if you have any other questions!! If you google this sauce, it also says "May contain traces of shellfish". So not vegetarian or vegan. This sauce IS in fact vegetarian and vegan. Here is the response to your comment:Regarding the shellfish warning: I emailed Koon Chun (the makers of the sauce) and below is their response. After reading their response, I conclude that this sauce IS in fact vegetarian and vegan. "This is to clarify you enquiry about the caution statement “ May Contain Traces Of Shellfish” on our Hoisin Sauce products.Due to the food allergen labeling regulation concerning we caution the possibility of presence of shellfish, because we used to use an oyster juice which is made from oyster products in making our oyster sauce. Our oyster sauce and hoisin sauce are share some common equipment in the production process, even the equipment is thoroughly cleaned after each production run, and also we have an allergen control policy that apply ATP test to avoid allergen contamination for further verify, however there is still a possibility of contamination. But the chance of our hoisin sauce containing traces of shellfish is very very small and this is a voluntary disclosure not required by FDA in USA. "They also informed me of the following response bellow, just to clarify in case anyone has any questions about the food coloring Red#40. They also in fact STOPPED adding any food coloring in Hoisin Sauce after February 2013. "The food coloring (FD & C Red #40/ E129/ 16035) also called Allura Red AC, is a red azo dye. It is originally manufactured from coal tar, now mostly made from petroleum. It is not derived from any insect. Therefore, the Red 40 is not derived from animal source. We understand that many people really to worry about food coloring. Thus in February of 2013 since production of hoisin sauce we do not add any food color, except we eliminated the food color, the recipe do not change. Also the content of hoisin sauce is clearly labeled, and it does not have food color. "Thanks for bringing it to my attention! And hopefully you get a chance to try out this recipe or others on my site! Oh no! Sorry...yeah Hoisin Sauce is one of those where I don't particularly like many brands. But you can always pick one they have and just try it before you use it. If you don't like the flavor of it plain, you won't like the flavor of it in the dish =) you can always adjust the amount of soy sauce depending on the taste of your Hoisin Sauce. The recipe given is for a sweeter Hoisin Sauce. Hope you find one out there! Is the chili sauce sweet or hot like sriracha? The chili sauce is hot only. Definitely not sweet at all. You can use sriracha, or i prefer to use any other hot chili sauce that doesn't have much other flavors, but sriracha would definitely work well too! I made this dish and the whole family loved it. keep it up. YAY! So glad you were able to try out this dish. Did you get the Hoisin Sauce I recommended in the recipe? Or did you try out another brand? We followed the recipe, and it turned out great!! Cleanup was easy since the entire pan of it was gone. It tasted really good with rice. We look forward to trying another recipe from your website. I'm so glad you enjoyed this recipe and were able to use the Hoisin sauce! Hopefully you get to try out some of the other Thai recipes I have posted! Just made this and it was soooo good! I used Thai Basil and an organic Hoisin sauce (I'm in London). Thanks for the recipe! Thanks for visiting the site! Loved to hear that you tried and enjoyed the recipe! It's nice to know that the recipe tastes good with other Hoisin sauce brands as well. What brand did you use? I'm always looking for other tasty Hoisin sauce brands since the one i recommend above is the only one I like so far. Hope you get a chance to try out other recipes from the blog! I just made this tonight and was so happy it turned out well! I used sweet chili sauce and it was really good. Thanks for the wonderful recipe! I'll be sure to make it again!! Thanks for visiting the site and thanks for the great feedback! This is one of my favorite Thai dishes...great to know you enjoyed the dish as well! Is this something that you think I could make earlier in the day and re-heat? I'm not terribly experienced with tofu but wanted to try it. But, I don't have the time to make it, except for early in the day. Thanks. YES absolutely! I make most of the food on this website earlier in the day and reheat it later on because of time. Especially this dish...I've made it several times in the morning or afternoon and then reheated it on the stove or microwave in the evening and had left-overs the next day without any problems! This dish still tastes great. Let me know how you like the dish! I tried this recipe using Dynasty Hoisin sauce and it was terrible, very bitter and just not edible. We threw out the whole dish. I'm so disappointed. I followed the recipe but I guess the hoisin sauce I used was not very good. I am not sure why it would be even close to bitter if you followed the recipe, other than perhaps the taste of the brand of Hoisin Sauce that you used. Did you try your HOisin sauce before adding it to the dish? The sauce in this dish is VERY basic and the flavor mainly comes from Hoisin Sauce, Soy Sauce, and Chili Sauce...so my guess is that the Hoisin sauce that you used was not very good. I've tried many different brands of Hoisin Sauce and have only liked the flavor of Koon Chun Hoisin Sauce. Surprisingly the other brands taste quite different.I'm so sorry you went through the effort of making this dish and not liking the result. This dish is one of my FAVORITES and is delicious. I'd recommend getting some Koon Chun brand Hoisin Sauce that I suggest and trying out the recipe again! I promise you will not be disappointed. Anjali, this look delicious and I am going to make it for dinner tonight. But the only hoisin sauce that my local store had was Sun Luck hoisin sauce. Have you ever tried this brand? I am a little worried because I don't want to have the same bad results that Debra above did! Hi London! No I have not tried that Hoisin Sauce. But no worries if you do not have the one I recommended. If you have a different brand, here's what I would do to ensure that the sauce still tastes great:The sauce for this dish is basically comprised of hoisin sauce, soy sauce, and chilli sauce, and that's about it. The corn starch is added as a thickening agent. Since I do not know what your Hoisin sauce tastes like, the best thing to do is to make sure you try it before adding it into the eggplant and tofu. The Koon Chun Hoisin Sauce is very much on the sweet side. So the amount of soy sauce and chilli sauce I indicate compensates for the sweetness. You should taste your Hoisin sauce and it should be on the sweet side. And make sure you like the taste of the hoisin sauce you have on it's own (it should not be bitter). If you do not, then you probably will not like the taste of the resulting sauce. Depending on how sweet your sauce is, you may need to add more or less of the soy sauce. So basically what I'm saying is to make sure you like the taste of your hoisin sauce, and then slowly add the soy sauce and chili sauce until you have a good tasting sauce. Remember as you cook it with the corn starch it will thicken. Pretty basic. I think where Debra may have had issues is that she may have started off with a hoisin sauce that did not taste great in the first place, or was not as sweet as the one I typically use and hence the sauce ingredient proportions may not have been correct for her. Hopefully that makes sense! =)If all else fails and you do not like your hoisin sauce or the sauce does not taste good for some reason before you add it to the eggplant and tofu, you can always use my fall-back Thai sauce comprised of soy sauce, corn starch, chili sauce, and brown sugar (you can find this sauce combination here:Good luck and hope that helps! This recipe is pretty basic so hopefully you like it with your hoisin sauce! Let me know how it turns out! I'm always looking for another great tasting Hoisin Sauce! The recipe turned out really well and the Sun Luck hoisin sauce was good! (Side note: Sun Luck hoisin sauce is gluten-free.) For the sauce, I used low-sodium soy sauce and actually added in about 2 tablespoons sesame oil. I also sprinkled roasted sesame seeds as garnish. Thanks for a great recipe! Yay! So happy it turned out well for you! I'm going to have to try Sun Luck Hoisin sauce, and thanks for the gluten-free note. Sesame oil sounds like a great addition to the dish as well...will have to try it out next time. Thanks for visiting the site and thanks for trying out the recipes! BTW...what store did you purchase that Hoisin sauce from? Or do you know what stores carry it? Thanks! My brother has celiac and has been looking for a good gluten-free hoisin sauce. I got it from my local Ralph's (in Los Angeles) so it might be available at one near you. The ingredients are: sugar, miso (water, soybeans, rice, salt, rice alcohol), water, molasses, vinegar, pumpkin, tapioca starch, salt, garlic powder, caramel color, sesame oil, spices, citric acid, xantham gum, natural flavors. You can add about 1/4 to 1/3 cup packed chopped basil. Add the basil at the very end (see the last step of the recipe above). Let me know how you like the dish! Thanks for a delicious recipe - and great instructions, Anjali. I made this tonight for my friends in Cape Town and it was surprisingly delicious. I agree that it's important to taste the sauce before adding it to the veggies so you can make sure it's balanced. I'm so glad you liked this recipe! It's one of my favorites! Thanks for visiting the site and thanks for the comment! Was amazed at how quickly you could make this dish. I have always labored over eggplant related South-East Asian dishes to make them come out just right. The use of water to cook the eggplant was a revelation....without the eggplant looking wimpy and grey. The dish was so good, I couldn't wait to gobble it up with fresh rice! Thank you! Yay! So wonderful to hear! Glad you enjoyed the dish. I felt the same way the first time I made this dish at home! Thanks for the comment and thanks for visiting my site! I tried this recipe and it came out awesome. . A lot of prep but well worth it. I never made tofu before or eggplant really. It just looked so good on your site I had to try and I'm glad I did. I'm now going to try the spaghetti squash recipe , the one with cheese and spinach and I hope it comes out just as good! Hi! Yay...I'm so glad you liked the dish! Especially since it seems like it was the first time making tofu for you! Thanks so much for the comment and for visiting my site!The spaghetti squash recipe is one of my absolute favorites! I love that dish and cacio e pepe using spaghetti squash! Let me know how it turns out for you! Thanks so much for the recipe & all of the nutritional info. It was scrumptious! I used Lee Kum Kee Hoisin sauce because I couldn't find the one you recommended at the only store I had time to get to. The only other thing I did differently was that I lightly seasoned the veggies and tofu as I cooked them separately. ...just a little garlic powder & very very light salt to bring out their flavor even more. I'm on a low carb diet right now & it was still delicious all on its own--no rice for me! I will absolutely be making again! Hi Cintia! So glad you enjoyed this eggplant dish! And it's nice to know that other brands of Hoisin sauce work well with this recipe. Lightly seasoning the veggies and tofu separately is a great idea. I've done this in the past several times by adding a small amount of soy sauce to the tofu after I put it aside. I'll have to try the garlic powder and salt next time.Thanks for visiting my site! Hope you get a chance to try out some more recipes! Let me know if you need any suggestions. I have made this twice already and it has been a huge hit, especially with people who are not big tofu fans. The one thing that I have had difficulty with is browning the tofu - no matter how much I mix and stir the tofu, it does not get brown enough. Maybe I need to do it for a longer time? Hi Manisha! So glad you all enjoyed this dish! It's one of my favorites as well! Regarding the tofu...the process of browning the tofu should be pretty straight forward as I described in the recipe. Are you using medium or firm tofu? Basically heat a non-stick pan with some oil and pan-fry the tofu after you have cubed it. Did you press the tofu gently to remove excess water prior to cutting it? All the remaining water should release and evaporate on the pan before it starts to brown. It's possible you are not cooking for a long enough time. I usually keep the heat on medium-high which helps speed up the process - just be sure the tofu does not stick to the pan at this high heat.Hope those suggestions help! Pan-frying the tofu makes it taste so much better! Let me know if you are still having problems browning the tofu and I can give you a few more tips.And try out the garlic-pepper tofu and sweet chili lime tofu next - they are super easy and really tasty! Thanks so much for the comment! I have Celiac Disease and it say "contains gluten". I didn't see anything with gluten in the recipe. Can you elaborate? Can I make it gluten free? Hi there! I have actually just updated the recipe post to state gluten-free option because there is a gluten-free Hoisin Sauce that I have found and love. I have been using SunLuck Hoisin Sauce when I want to make this dish gluten-free (which I have been able to find at my local Ralphs Grocery Store). This brand of Hoisin Sauce actually tastes good and does not contain gluten. There have been other followers who have used this brand of Hoisin Sauce with this recipe and have loved it! Hope that helps! Let me know if you have any other questions! Finally made this today for my family in TX! Everyone loved it, kids included :). Awesome! Did you end up finding another brand of hoisin sauce that you liked out there? Glad everyone, kids included, loved it! Thanks so much for the comment! In reply to the poster who ended up with a bitter dish, it might have been due to the eggplant, not the sauce. Many recipes call for salting and draining eggplant before cooking. I have had success in eliminating bitter eggplants by simply tasting the raw eggplant after cutting off the ends. Hope this helps! Thanks for the tip! That is also very true...I actually just used a few eggplants that were very bitter because of their outer skin and seeds. Thanks again for the comment and suggestion! And thanks for visiting my site. Yay so exciting! I'm so happy you gave this recipe a try...it's by far one of the more popular recipes on my site! When I first developed this dish, I was surprised at how easy it was to actually make at home, and how delicious it tasted without all the extra oil they put in restaurants. I will have to check out that Hoisin Sauce next time i'm at the store...I'm always looking for other brands, especially since the one I use I've only found at 99 Ranch. Although recently I've used Sun-Luck Brand (gf) at Ralphs and love it as well.I actually just made this dish last night as well for dinner and my kids (4 and 2) both loved it with some brown rice. My older one took leftovers to his first day of preschool this morning =) so I hope your son loves the dish! As always, thanks so much for the comment! Awesome! So glad you liked this eggplant dish. And that's awesome you have a lot of home-grown eggplants...this recipe is perfect for that. This recipe only has tofu in it so I'm assuming you meant the opposite way around. Thanks so much for trying out the recipe and visiting my site! Hope you get a chance to try out some other recipes! Delicious!!! Why do you list the hoison sauce measurement as 4 1/2 T Why not 2 T? Hi Amanda, thank you! I'm not quite sure if I understand what your question is. The recipe calls for 4 1/2 tbsp of hoisin sauce, not 2 tbsp. Let me know if I mis-understood you or if you have any other questions. Hope you get a chance to make it! We had it for dinner last night and it was delicious. as to the measurements 4 4 Half tablespoons equals 2 tablespoons (2 halfs = 1 whole) . Am I totally off base here? Haha...ok I get it now. It's not 4 (1/2 tbsp), it's 'four and a half tablespoons' of the sauce =) So you probably ended up adding a little less than I suggested in the recipe. But glad you guys loved the dish! Did you end up getting the Hoisin sauce I recommended? Amazing recipe, I love egg plans, very colouful presentation. Thanks for sharing. Thank you! This is by far one of my favorite eggplant dishes and one of my post popular recipes on my site. Hope you get a chance to try it out. Thanks for visiting! YAY! Love that you were able to get your hands on some Koon Chun, that's my to-go. But in case you are ever in a bind and don't have that sauce, my next favorite is Sun-Luck Hoisin Sauce (which also happens to be gluten-free)...i've found that brand at most all grocery stores. Did you buy the sauce online? Thanks so much for sending over the picture as well! Try my garlic pepper tofu or cauliflower rice dish next! Oh my!!!!!!! AMAZING!!!! I must say I made this because I didnt have much in the fridge and it looked easy and fast for a monday night dinner. My husband hates tofu and vegetarian meals so I didnt think this would be a big hit or anything of that sort. Well I made it and I used orange peppers instead of yellow because I already had them in the fridge. We had it with quinoa. My husband absolutely loved it and so did I! I will be using this recipe regularly from now on. Flavour was amazing and it was just all together so delicious and comforting. We were so satisfied and full and even had leftovers for 2 lunches the next day. My husband even sayd he loved the tofu in it. He said he loved the tofu..... every time the word tofu has even come up he has protested and complained endlessly and now he says he loves it?! Well needless to say he has asked me to add this to the recipe list and make it again. And I was very impressed with it as well. The whole meal was just far beyond my expectation and everything fit together so perfectly. We live in Bc Canada so the only sauce I found at the store was Kikkoman Hoisin Sauce. =) Oh wow! Thank you so much for the great review on this recipe! I loved reading your comment, and I'm so glad you guys enjoyed the dish! It's awesome knowing your husband now loves tofu with this dish! For me, when it comes to tofu, it's all about the texture and flavor. If you texture it right (pan-fry it) and flavor it, I love it, but if it's simply added into things, then I'm usually not a huge fan. Thank you so much for trying out the recipe, and again thanks for the comment! Really made my day. I have many more tofu dishes, so definitly give them a try. Another one of my favorites is the Garlic Pepper Tofu, Sweet Chili Lime Tofu, Veggie Tofu Stir-Fry, and any of my Thai noodle dishes...I generally try to keep the sauces pretty simple. 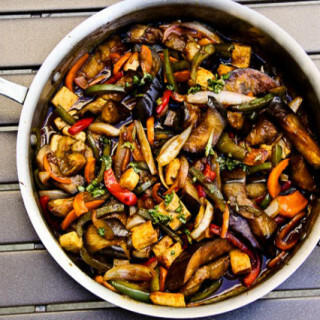 I also have a Sweet and Sour Veggie Tofu dish if you like sweet and sour flavors. Also check out my Mexican Tofu Scramble Dish...I have a unique way of altering the texture of the tofu in this scramble to make it taste awesome! And you can really add anything else you want in it. Thanks again! And let me know if you try out any other dishes! I made this tonight and it was delicious! I changed the recipe slightly and used a mix of sweet soy and regular soy and also added a little sweet chilli along with regular red chilli. The Hoisin sauce I used (in Australia) was a slightly bitter so the sweet soy and dash of sweet chilli cut through the bitterness.I also stir fried the capsicums (peppers) quickly to give them a slight char grilled flavour, then cooked as per the recipe. Yay! Glad you enjoyed the dish! And yes, based on the brand Hoisin sauce, I've found that they are all very different. So you will need to adjust the amount of soy sauce/sweetness. Nice to know you were able to find the right balance with your brand of Hoisin sauce =) I love that char grill flavor as well, which is why I typically stir-fry/saute my peppers and onions prior to adding them into the dish =) Thank you for trying out the recipe and letting me know, and great modifications! This recipe is absolutely delicious! I opted out of the corn starch and it still came out beautifully. I will be making this dish for years to come! Thank you so much! Awww...so happy you loved the dish! The Hoisin sauce is actually quite thick, so I can see how you left out the corn starch...plus, the flavors are what matters the most =) Thanks again for the comment, so glad this dish is going to become a staple in your house! Hope you get a chance to try out some of the other thai dishes on my site. Hey, Really keen to try this recipe. I don't have tofu so I'll just throw in extra veggies and broccoli but 1/2 cup soy sauce seems like an awful amount of sauce. Worried it will be very salty. Is yours salt reduced? Hi! I'm excited for you to try out this recipe! Yes, any other veggie in this dish would taste great if you don't have tofu. I use regular soy sauce or san-J GF tamari for this dish. The amount of soy sauce was determined based on the other sauce ingredients. Depending on the type of Hoisin sauce you use (since different brands vary quite a bit in taste), you may need less soy sauce. The brand I recommend in the recipe is on the sweeter side, hence the amount of soy sauce is based on this. This dish actually makes quite a few servings and has a good amount of sauce. If you feel like it may be too salty for you, feel free to reduce the amount of soy sauce, taste test, and adjust as needed. Hope that helps! Let me know how it turns out! I don't generally shy away from salty food, but with a 1/4 c of tamari, this is a bit too much. Have you actually tried the dish yet? or just gave it 3 stars because of the ingredients? You can always add less tamari if you want to make it less salty, but the hoisin sauce balances out the flavor. This is the best recipe ever! I use sesame oil and pink eggplant. I will be making this frequently. Thanks for a great recipe!! This sounds very good! I plan to try it with my favorite hoisin sauce, Soy Vay, which tastes like some of the Moo Shu sauces I've had when eating out. This recipe is by far a favorite of many! Definitely try it out - easy and delicious! I'll have to check out that hoisin sauce. And let me know how you like this dish once you make it! Thanks for following! I made this tonight but didn't have every ingredient and just subsituted for the things I didn't have and it turned out delicious. No hoisin sauce on hand so I just used soy sauce and it was flavorable enough from the garlic and onions already mixed in. Also threw in some red pepper flakes because I lacked that spicey part and that did the trick for us! Thank you for the receipe! So glad you enjoyed the recipe! Nice to hear that it still tastes great without the hoisin sauce! Thank you for the comment and for following...hope you get a chance to try some of my other Thai dishes! Hi Judy! So excited for you to try out this recipe - you will love it! Honestly, I've never tried freezing this dish, but I have cooked eggplants in a similar fashion for another Indian dish and frozen it and it tastes great still once you defrost it. Although I can't guarantee that the eggplant texture will be exactly the same, but it should be pretty close. If you do make it and freeze it, I'd highly recommend taking it out of the freezer and placing it in the fridge to defrost 24 hours ahead of time so that it defrosts almost completely by itself without having to thaw it in the microwave or over the stove. And yes, basically steaming the eggplant with a little oil and as little water as you can get away with makes it get that creamy consistency which I love as well. In fact, many restaurants fry their eggplant for this dish, but this is a healthier, less oily way that I found works great. Also, I have two other favorite eggplant recipes on my site which I make all the time and both of which should freeze well: Roasted Smoked Eggplant Curry (http://vegetariangastronomy.com/2015/04/roasted-smoked-eggplant-curry/) AND Caramelized Onion, Roasted Eggplant, Tomato Pasta (http://vegetariangastronomy.com/2014/09/caramelized-onions-roasted-eggplant-tomato-penne-pasta/). I in fact just made the pasta dish this week. I love it because you can simply dice up all the eggplant and let your oven do the work =)Enjoy your explosion of veggies!! I love home-grown produce! Let me know how it turns out if you end up trying any of my recipes. And thanks for following! Thanks Anjali! I'm so excited to try these eggplant recipes <3 I'll let you know how it goes! And also . . . we have A LOT of zucchini and yellow squash now too. I wonder if these would be good to add to your recipe . . . or maybe it would change the flavor profile too much? Thoughts? Hmm...no, I typically add zucchini to my veggie tofu stir-fry dish, but I don't think it'll go well in this eggplant dish. The flavor of zucchini and squash will change the dish and may also blend in too much. But my veggie tofu stir-fry dish is super easy and my go-to when I want to use a bunch of veggies up! Here is the recipe: http://vegetariangastronomy.com/2013/01/tofu-veggie-stir-fry-vegan-contains/ . As for other zucchini thoughts (I actually just had five 2.5 lb. zucchinis growing in my yard this past summer!!) - I made a roasted zucchini soup (didn't write down the recipe though so that may not help), and also make this baked pasta dish ALL the time and we love it - http://vegetariangastronomy.com/2012/09/baked-pasta-wroasted-red-peppers/ . I'm not sure if you are vegan or not, but before I went vegan, I developed this zucchini lasagna recipe which is a favorite in my family http://vegetariangastronomy.com/2014/12/zucchini-corn-stuffed-lasanga-rolls-gluten-free-contains-dairy/ . Hope that helps a little! I also had the same problem this summer...too much zucchini =) good problem to have I suppose. Enjoy! Please feel free to let me know if you need any other recs! I love what you guys are up too. This type of clever work and exposure! Keep up the good works guys I've added you guys to blogroll. This is my most popular recipe, so I'm excited you tried it! So awesome to hear that it's one of your husbands favorites, and that coconut basmati sounds delicious! Thanks again for following, trying out my recipe, and commenting! I appreciate the feedback! Hopefully you'll get a chance to try out some of my other popular Thai dishes! Hi Angali! This recipe not only looks great but delicious as well . I have made this recipe yesterday and it was so delicious and yummy. whole family liked it very much and says thanks to you for sharing this recipe. Good luck Angali and keep it up. Keep sharing more such recipes also. Thank you Mikkel! It's one of my most popular recipes so I'm glad you loved it! Hopefully you get a chance to try out a few more of my recipes, especially my other Thai ones. Thanks for following and the feedback! Next weekend I am going for trip with my friends. Therefore, I am thinking to tell mom to cook this yummy dish for me. It looking very tasty and yummy. Moreover, I surely share this yummy recipe in my friend circle. Thanks for this amazing post. Thank you! You will love it, and it's really easy to recreate! Let me know how it goes. Just made this tonight and it was AMAZING! This recipe is how I found your site and it is the first thing that I have made from you. I am learning to be gluten-free and dairy-free out of necessity and am in love with your site. Thank you for making easy recipes to follow that are as yummy tasting as they are to read! Thank you so much Brooke! It's comments like yours that keep me going, made my day! I'm so glad you tried out this recipe and loved it, as it's my most popular one on my site. I've been vegan for more than a year now and my brother has celiac so I'm very gluten aware in my recipes and try to make them gluten-free or have gluten-free options. Learning to be GF and dairy-free is more of getting your pantry ready with the right ingredients and experimenting in the kitchen which it seems like you're doing already! Please don't hesitate to contact me if you're ever looking for a certain type of recipe or have any questions! There are also great products out there now that makes being gf and dairy-free easier as well! Thank you for following! Hope you get the chance to try other recipes. THANK YOU so much for the awesome review and for trying out my recipe! Your dish on IG looked amazing...I wanted to jump right in with a spoon! I honestly don't crave this dish at thai restaurants anymore after making my home-made version...especially since I always find the eggplant to be fried and really oily at restaurants. I'm assuming you were able to get your hands on some Koon Chun Hoisin sauce. And so glad the tofu turned out! I've been pan frying my tofu like this with minimal oil for as long as I can remember in all my dishes and LOVE the way it turns out! They key is to also have a good pan. Thanks again for posting, tagging me, and trying out my recipe! Garlic Pepper Tofu, Tofu w/Spinach and Peanut Sauce (like Pra-Ram), Sweet Chili Lime Tofu, and really any of my other thai dishes...try them out next you'll love them! Is Hoisin Sauce on the sweet side of things? We're not fans of having sweet tastes in our meals; would you recommend any substitute to the Hoisin sauce? Hoisin sauce is typically on the sweeter side of things, although it definitely depends on the brand of hoisin sauces you use. Some can be less sweet than others. All that being said, I'm sort of like you in being picky with my sweet tasting things in meals, and hoisin sauce is no where near as sweet or close in taste to a sweet and sour type sauce. If you're looking for something other than hoisin sauce, another favorite sauce combo of mine that would probably work well in this or any other tofu veggie stir-fry dish is soy sauce (or tamari), chili sauce, and either maple syrup or brown sugar + a little cornstarch and water to help thicken up the sauce. 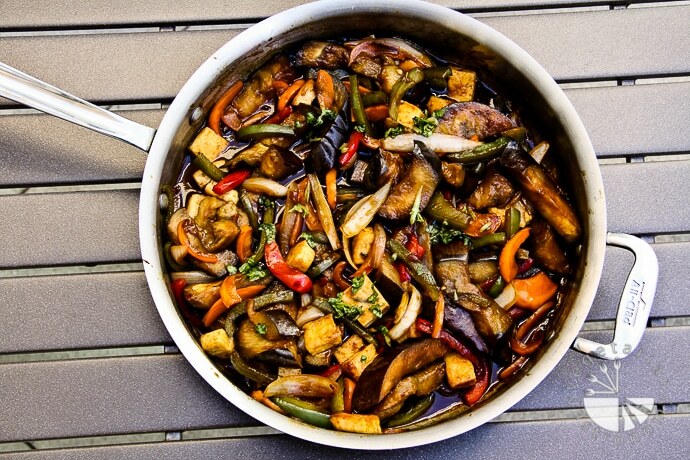 Check out my Veggie Stir-Fry w/Tofu recipe! Let me know if that helps. Finally tried this recipe....so delicious! This is our first time trying Thai basil and we just love the flavor! Thanks for sharing this recipe! Oh awesome! So glad you loved it...it's one of my favs and so much better than the restaurant oily version! Were you able to find the hoisin sauce i recommend or did you use another brand? Thanks so much for trying it out! Try the garlic pepper tofu, sweet chili lime tofu, or the sweet & sour thai dishes next on the site! Easy to make and delicious. I substituted the tofu for leftover steak and used a different brand of low-sodium soy sauce and hoisin sauce that was already in my fridge. The recipe makes 3/4 cup sauce but I only needed to use half and saved the rest for another day. Served on white rice with a spring roll on the side. Yum! Thanks for trying it out! Glad to hear you enjoyed the recipe with a different brand soy sauce as well! Thank you! Thanks Jen! Glad you enjoyed it so much and nice to know it works well with different brands Hoisin Sauce! Thanks for the comment! If I want to add chicken instead of tofu, how much should I add? Do I need to do anything different while cooking? I'm actually vegan and vegetarian before that so I wouldn't be the best person to ask. But...I know other people have sub'd other main ingredients for the tofu or eggplant in this dish. Made this last night as my boyfriend grows Thai basil and had wayy too much. The dish was delicious!!! We both had seconds. I should have doubled it to make it last longer. It also was easy to make on a weeknight and I'm always looking for that. The only thing I will change next time is doubling the recipe and baking the tofu. I didn't do any of the fancy tofu recipes mentioned here. I just followed the instructions and pan fried it in oil. On its own, it wasn't anything special. Mixed in with the sauce and veggies in the end, it was great. But I think I could have baked it and cut some of the oil from the recipe and it would have had the same end result. Thanks for the recipe!!! Thanks for the great review Lauren! So glad you loved this recipe...much better and a lot less oil than resturant version :) yes, totally agree with you on the tofu, it usually takes on the flavor of whatever you season it with otherwise it's pretty bland. I bake tofu all the time and it's definitely a great option also (and oil free). Just cut it, take out water, and place it single layer on parchment paper and bake at 400 degrees until crispy. I do both often and either version would taste great in here! Thanks again! I have a few other tofu recipes on this site if you want to take a look! Just finished trying out the recipe and it came out great! I haven't cooked with eggplant before so that may not have been perfect lol but following the recipe it turned out good:) Also, for others trying the recipe the only Housin sauce I found at the store was just the store brand(Kroger) and it worked out fine for me;) Boyfriend was snacking on it straight out of the pot! Thanks again! So awesome to hear, thanks Maria for the great review! And glad you also found another hoisin sauce that you liked! Hope you get a chance to try out a few other of my thai recipes! This recipe looks really good and easy! I just made this for lunch and we loved it! Would use less soy sauce next time as it was too salty and I had to balance with some brown sugar. Perhaps tamari is not as salty as the one I used. Thanks so much for a yummy recipe. Will definitely make again. Thank you!! Yea i think it also depends on the type of hoisin sauces you use. Some are sweeter than others. but I've used both tamari and regular soy sauce. Thank you so much for trying it and the great review! I made this today and used light tamari...it was the only kind I had on hand. Used random hoisin I found in the fridge. It turned out so good! Definitely will be a staple in my house. That's great to hear! Also nice to know it works with random hoisin sauce...i think as long as you like the flavor of the hoisin sauce you're using it'll turn out great! Thank you! What's the serving size for the nutrition info? It's 6 servings, the exact size unfortunately I'm not 100% sure. It's a standard serving size for 1 meant for other things to be enjoyed with it. Sorry about that. Next time I make it i'll try to update the recipe. I calculated serving based on how many it fed for us. So glad you loved it!! Thank you!! This is delicious!! I made it last week with twice the eggplant (my garden is very generous this year) and my husband, son, and I ate every bit of it (no rice or other sides). They have already asked for it again so I'll be making it tonight. I used Lee Kum Kee hoisin sauce and Thai basil from my herb garden. I'll double (maybe triple) everything this time. I think I could eat it every day. Thank you!! What an awesome review!! Thank you so much glad you guys love it! Love home grown veggies...so nice you have so much eggplant and basil! Glad it worked out with another brand hoisin sauce! I went to a Thai restaurant with my team today and had a Thai Basil Eggplant dish and was obsessed. I figured I'd try to find a recipe and recreate it and did JUST that tonight, adding broccoli and fresh jalapenos to kick up the heat (the restaurant version from earlier had jalepenos in it and I love broccoli). Oh. My. Gosh!! It was JUST as good as the restaurant!! I was so impressed I shared the recipe with my colleagues, family and friends. Thanks for sharing!! Thank you!! What a great review and so glad you loved the recipe! I was going to create a healthier non-fried version of the one at resturants and this recipe definitely doesn't disappoint!